Another Entry for DesignsByHumans.com You Have The Right To Vote! 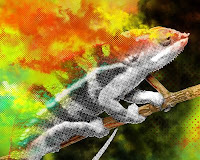 Vote for "Smoking Chameleon" on Half Tones...you can find this at www.designbyhumans.com please do register and vote if you like the design so they can print. This is for the purpose of awareness because chameleons are on the verge of extinction...so please do support this cause. Thanks!! !